Isaac Hayden says Newcastle United's seven-game winning run will be the last thing on the players' minds when they take on Cardiff City. Rafa Benitez's side went top of the Championship and progressed to the quarter-finals of the EFL Cup last month. 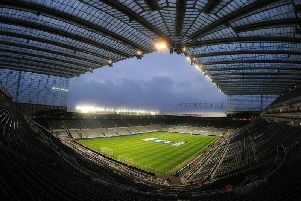 Newcastle take on Cardiff at St James's Park looking to maintain their position at the top of the table. Midfielder Hayden – who helped Hull City win promotion to the Premier League last season – feels the club's recent form "means nothing" given that there are still 31 games left to play in the league. "Everyone's talking about seven wins in a row, but it means nothing at this stage of the season," said Hayden, speaking at the Newcastle United Foundation awards dinner this week. "It's about the individual games, and that's how we're going to take it. "At the end of the day, if we can keep winning games and keep the run going, we'll still be at the top of the table, which is the most important thing." Cardiff, a point above the relegation zone, sacked manager Paul Trollope last month after a poor start to the season. And Benitez and his players will know what to expect from a team prepared by Warnock. "Cardiff have just got a new manager, an experienced manager, who's going to want to implement his own style of play," said Hayden. "But I think it's the same thing. It's about us. We'll do our homework, as we always do. It's up to us to match their workrate and endeavour, and our quality will shine through." Newcastle beat Preston North End twice last week. United routed a weakened side 6-0 in the EFL Cup on home turf before beating a full-strength team 2-1 at Deepdale. And Hayden felt the away fixture was one of the toughest, physically, that Newcastle have had so far this season. "To put it simply, it was horrible," said the 21-year-old. "There wasn't much of a chance to get the ball down and pass it, which was a little bit frustrating considering the players we've got in the squad. "Preston made it that way and they made it that way for a reason, and we had to adapt to it. "We did that really well. We've got the players, the skill, the battling quality and the unity, so, for me, it's about matching the other team's workrate, which we did. If we do that every game, I think we've got a great." Hayden feels United's ability to battle, as well as play attractive football, sets them apart this season. "You've got to have everything, and it showed on Saturday that we do have everything. We've got the quality – individually and as a squad – and we've got the fight. "It wasn't the most enjoyable game of football (against Preston at Deepdale), but there are different styles of play. "There are games that are going to be one and two touch, and there are games where you're going to head the ball more than you pass it. At the end of the game, it's a game of football and you have to get three points." Meanwhile, Hayden and his team-mates attended the Foundation's dinner at St James's Park this week along with United manager Benitez and a number of his team-mates. The charity harnesses the power of football to help disadvantaged children, young people and families in the North East. "It's great for the players to come here and show our support," said Hayden, who believes Newcastle's players are closer to the fanbase that at many other clubs. "We're showing a United front and everyone's pulling in the same direction."